"It’s our duty to safeguard the environment and people of Boulder County and these lawsuits are our implementation of that responsibility." Boulder County, Colo. - Boulder County filed lawsuits in Boulder District Court today against two oil and gas companies: Crestone Peak Resources and 8 North LLC (a subsidiary of Extraction Oil and Gas). Both of the companies want to construct large multi-well drilling pads on property that is either county-owned open space or protected by county conservation easements. The lawsuits contain multiple claims, all of which are focused on whether the companies have the legal right to drill. On March 17, 2017, Crestone filed an application for a Comprehensive Development Plan with the Colorado Oil and Gas Conservation Commission (COGCC), seeking to conduct hydraulic fracturing operations in a 10-square mile area of eastern Boulder County. 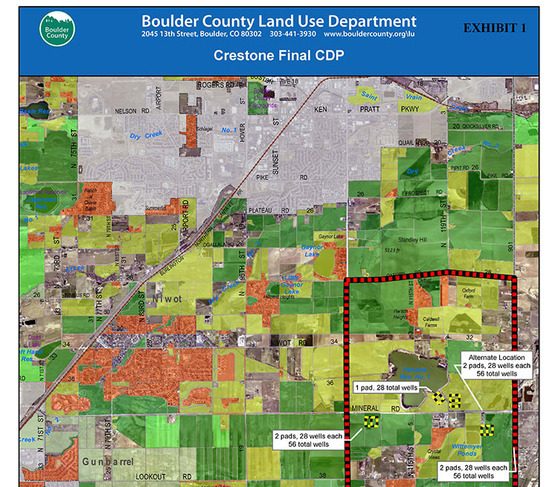 COGCC Director Julie Murphy issued a report on July 30, 2018, finding that the drilling locations proposed by Crestone were suitable. All of those locations are on Boulder County open space or privately-owned land protected by county-owned conservation easements. The COGCC is scheduled to decide whether to approve the Comprehensive Development Plan at its October 29-30 hearing. 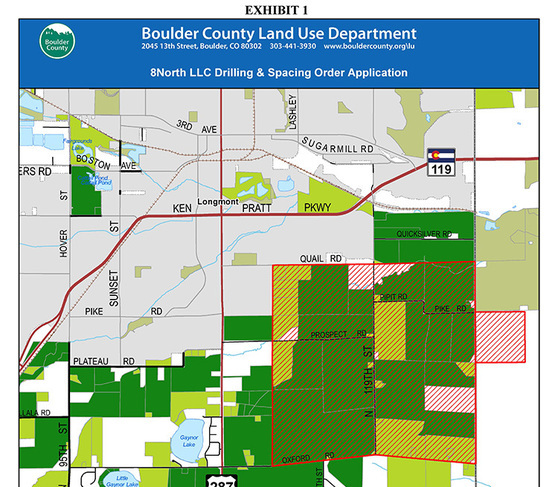 Separately, 8 North LLC obtained COGCC approval for drilling and spacing units in two Boulder County locations. For one of those locations, 8 North LLC proposes to place a 32-well pad on land protected by a Boulder County conservation easement in Weld County. The other unit will be drilled by 20 wells located within the Town of Erie. The County has separately appealed the COGCC approval of the two drilling and spacing units to the Denver District Court. The new lawsuit alleges that 8 North has violated several leases and the conservation easement in the area. In both lawsuits, Boulder County refers to a Colorado statute that prohibits someone from injuring or destroying conservation values protected by a conservation easement. The county alleges that the proposals to place multi-well pads on conservation easements violate this statute. In many cases, the property owner leased out the minerals prior to the county purchasing the conservation easement. The lawsuits are not limited to claims regarding the conservation easements. The county also alleges that both companies have violated several oil and gas leases in a variety of ways. Note: The county has separately appealed the COGCC approval of the two 8 North LLC drilling and spacing units to the Denver District Court. The lawsuit filed on Sept. 25 against 8 North LLC alleges that 8 North has violated several leases and the conservation easement in the area.